Allen Gossett, David Robinson and the team at Aquanetics begin their Kickstarter campaign with a startling statistic: every year 3.4 million people die from water related diseases due to a lack of clean drinking water. 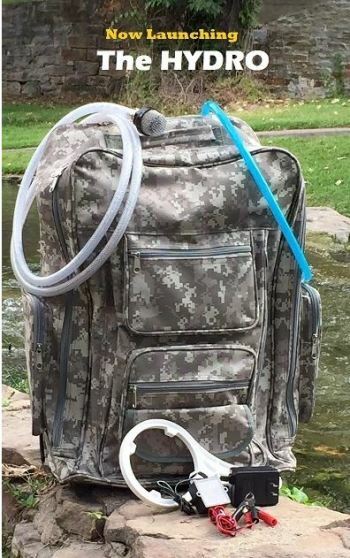 This has been the focus during their development of Hydro, a freshwater purification system that fits in a backpack and can collect its own solar energy to run. The system isn’t just for the developing world but also disaster relief, outdoors fanatics, and in the case of societal collapse. Most of the campaign video shows David and Allen using the Hydro on some Mississippi River water in St. Louis, Missouri. In 2012 the Mississippi River won the title of the country's second most polluted waterway. Allen says the pack will purify water to 99.9% purity. 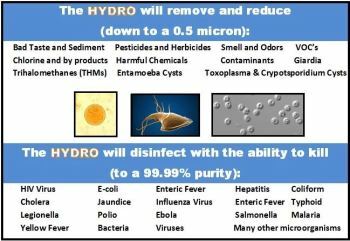 Sediment, pesticides, smells and odors, chlorine, contaminants, THMs, Entamoeba cysts and toxoplasmas are all filtered out through the Hydro to a 0.5 micron level of purity. The team claims that the purifier will disinfect HIV, e-coli, enteric fever, hepatitis, cholera, jaundice, influenza, legionella, polio, ebola, salmonella, and yellow fever to a 99.99% purity. Separate filters can be purchased to greatly reduce iron, lead and radon but there is no purity claim. Radiation and radioactivity are not removed from water. The system itself is certified at the NSF42, NSF51, NSF61 and USP VI levels, and exceeds water purifications published by the World Health Organization. The current system has a standard 110 / 12 Volt float charger but solar options are available for those without access to power. An estimated 120 gallons can be purified on a single charge. These are obviously highly technical and competent folks but some of the text on their Kickstarter page feels like they tried to dumb it down for everyday people and the syntax went wonky. Hydro looks like a great product and it’s interesting that they envision it being used as a source to help developing nations while still marketing it to survivalists here in North America. Seawater is the next goal for the team and they hope to have seawater filtration options in place by the middle of 2016.